Supporting a pain free world! 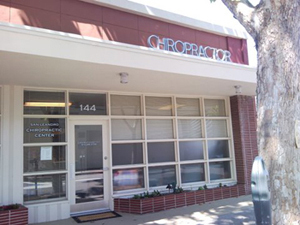 Thank you for visiting San Leandro Chiropractic Center. and located in the heart of downtown San Leandro. With over 20 years of expertise in chiropractic care, Doctor of Chiropractic, Dr. Chris MacChesney, is committed to administering better health and wellness for his patients. Those seeking treatment with Dr. MacChesney are assured that their health is in great hands. Our veteran Doctor of Chiropractic provides the finest quality treatment with the most modern of equipment and technologies in chiropractic care. Dr. MacChesney and the staff at San Leandro Chiropractic Center look forward to providing you and your family the excellent service that has allowed us to continue thriving in chiropractic care. © 2015 San Leandro Chiropractic Center. All rights reserved.